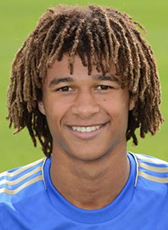 Highly rated prospect Nathan Ake moved abroad in summer 2011. He changed the youth academy of Feyenoord for Chelsea in England. The young defender made his first-team debut in the final moments of an away league game at Norwich on Boxing Day 2012, and his first start in an FA Cup fifth-round tie away at Middlesbrough at the end of February 2013. In April 2015, Aké was loaned out for a month to Championship club Reading. In August 2015, Aké was again loaned out, this time to Premier League club Watford on a season-long loan move after having signed a five-year renewed contract at Chelsea until 2020. The season 2016-17, Aké was again send on loan. This time he can show his qualities at AFC Bournemouth. In winterbreak, Chelsea decided to bring the player back and cancelled the loan contract. In July 2017 AFC Bournemouth did another attempt to get the talented defender into their jersey. The persuaded Chelsea to let Ake join the club on a 5 year deal on a 23ME deal. Chelsea also received the first option to buy the player when it becomes available. In March 2017, Nathan Ake received his first call up for the Dutch A squad.